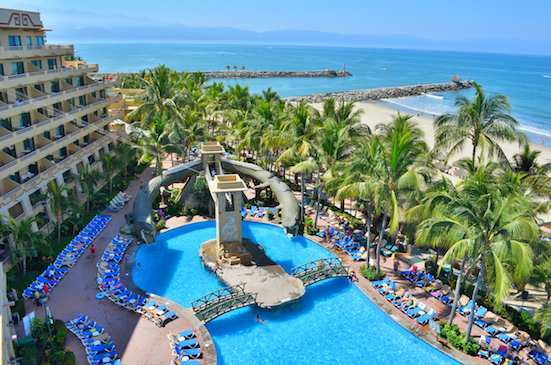 PV: Paradise Village Marina - A Resort Vacation! PV: Paradise Village Marina – A Resort Vacation! 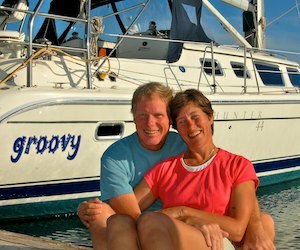 Early April, 2013 – After enjoying the wonderful outdoor market in La Cruz de Huanacaxtle, we took a brief, hour-long sail aboard Groovy to Paradise Village Marina, where we were suddenly surrounded by all the comforts of shore-based living. And and then some! 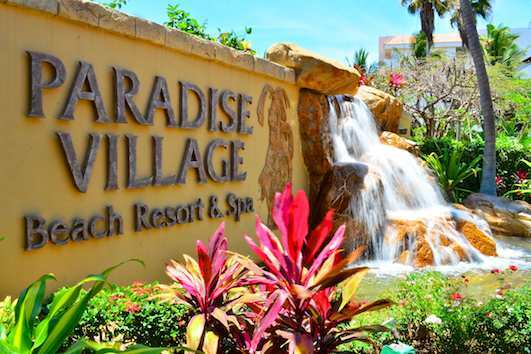 Paradise Village Resort – What a Place! Sunrise surrounds Groovy in its slip. After five months of rolling around in small coves and bays, the luxury of Paradise Village Resort was totally over the top for us. Paradise Village “Dragon Pool” with the beach and bay beyond. 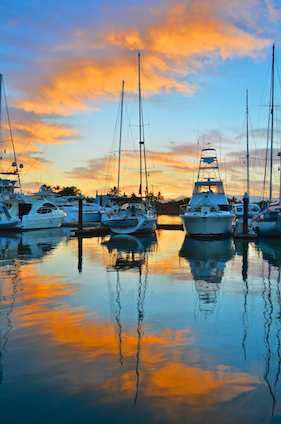 The marina sits in an estuary, and at sunrise the water is often like glass. One morning we were blessed with a spectacular sunrise that embraced Groovy. It felt really strange to be able to walk right off the boat and into a resort. No mad dash through the surf to land the dinghy, and no salty and sandy feet when climbing back aboard. The dinghy even began to gather dust in its spot hanging off the transom. 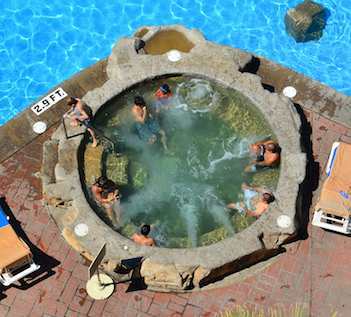 The hot tube is a popular place. Paradise Village Resort just begged for exploration. Looking down from a balcony near the top of one of the buildings, we could see the “dragon pool” that has two water slides where squealing kids shoot out of the mouths of dragons. 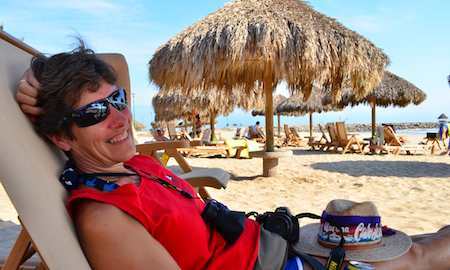 There are rows of palapa-chairs on the beach by the bar. Beyond the poolside chairs and palms, we could see the pier that marks the entrance to the marina channel and the beach and bay. The hot tub looked really inviting from this balcony too, and we discovered that quite a few cruisers spent their evenings there after the sun went down. Hey – we’re on vacation (from our vacation)!! 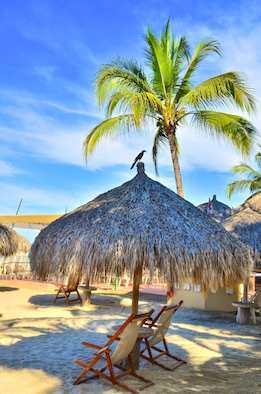 Out on the beach there are rows and rows of lounge chairs sitting under thatched umbrellas. For a few days we ran around so much, taking it all in and rejoicing at being able to live at a resort (how did THAT happen? ), that we didn’t stop to take advantage of any of it. We just took a million pictures and said “wow” over and over. 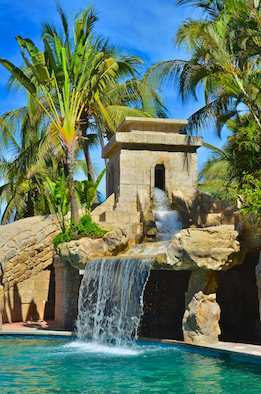 The “Waterfall Pool” at Paradise Village. But then we got down to the business of vacationing, like everyone else around us, and we spent an afternoon hanging out in those wonderfully inviting chairs. Pretty darn nice! 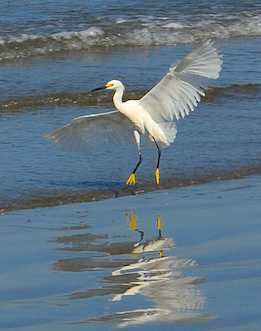 A snowy egret comes in for a landing. The other big pool at the Paradise Village beach resort is the “waterfall pool.” Playing in the spray in this pool was fun, but what really got me excited was the fabulous shower in the spa. For five months I had been dancing around in a phone booth for my daily shower, but not any longer. 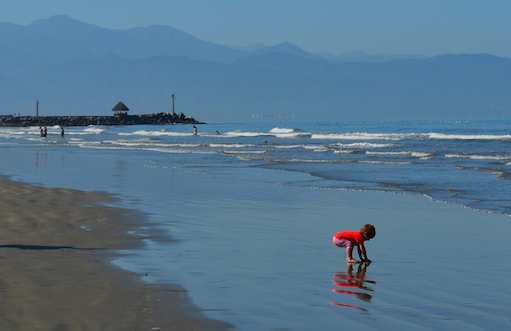 We just loved watching the kids play on this beach in the mornings. The “ladies room” in the spa isn’t just a row of toilets. It is a haven for women where all your weariness and cares of the day just melt away. Beyond all the massage rooms, where the masseuses wear crisp white uniforms and the vacationers kick back in plush robes, there is a candle-lit hot-tub. 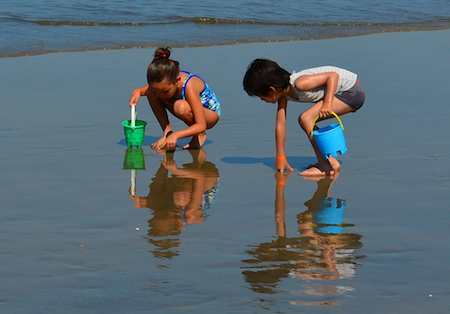 Treasure hunting on the beach. This darkened tub is surrounded by cushioned lounge chairs and glass vases filled with water and floating flower petals. The air is thick and moist and sooo relaxing. Oh my. When I walked in, gentle, soothing, new age flute music wafted softly through the warm mist, and no one was there. I submerged myself in the luxurious hot water and basked in that bubbling tub for what seemed like hours. Once I was sufficiently relaxed, I contorting myself into all kinds of crazy positions in front of the jets to massage all my sore spots and bruises from the boating life. Pure heaven! Then I moved on to the immense shower. Sigh. The tour boat operators struggled to get their boats off the beach sometimes. The shower was made of fancy stone tile and was very spacious. Three big dispensers were filled with sweetly scented, high quality shampoo, conditioner and body wash. None of that one-bottle-does-it-all stuff here. And the hot water just ran and ran and ran. I emerged a long time later, quite pink and very wrinkled. I was so excited about all this that after gushing about it to Mark for a while (he rolled his eyes a bit), I started going on and on about it to a neighbor down on the docks. A unique wooden cruising boat was beached in front of the resort. She laughed as she listened to me and then informed me rather bluntly that we cruisers weren’t supposed to use the spa. It was only for the highest paying resort guests. Oh, man! Really?! I had been ready to move right in and stay forever. One day, “Flying Dragon,” a very unusual wooden cruising boat, ran into trouble and grounded hard on the beach. All the cruisers from the marina ran down to the beach to see what was going on and try to help out. Taking a break from shoveling. We discovered that it had beached the night before while coming into the marina, and as the day progressed, the community efforts to assist the folks on this boat grew and grew. All kinds of ingenious tricks were employed to try and dislodge this boat. 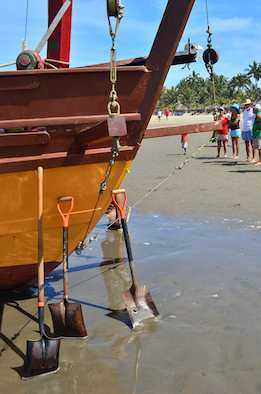 Men began shoveling around it, then they used a torch to remove the rudder, and finally they drove a backhoe onto the beach to dig a trench around the boat. At high tide a huge tug-of-war line of men stretched far out into the water and pulled the bow towards the bay. After sunset the boat finally floated off and was able to limp into Marina Nuevo Vallarta across from Paradise Village Marina. 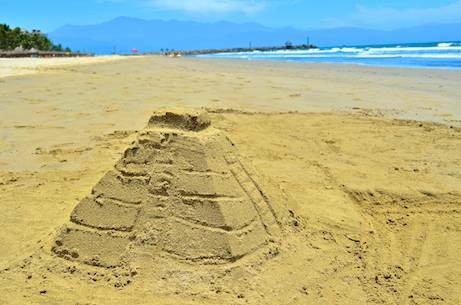 An ancient Mayan temple in the sand…! 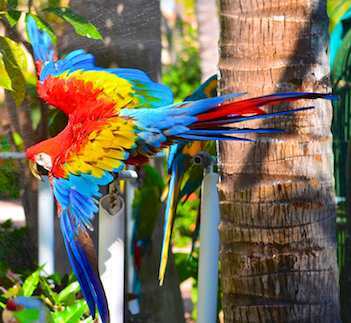 Paradise Village is very grand, and the theme at the resort is ancient Mayan culture and history. Even down on the beach someone had built a Mayan temple sand castle. Up at the resort, the arched doorways and windows have the classic tapered edges and flat tops of the ancient Mayan style. 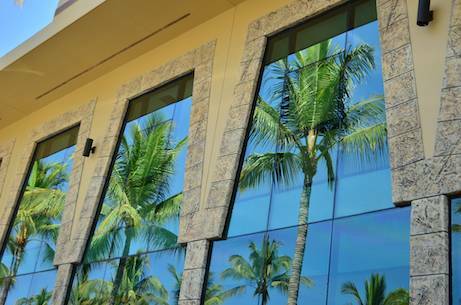 Mayan history is reflected throughout Paradise Village Resort. Every building is named for one of the famous landmarks of the ancient world: Palenque (Mayan ruins in Chiapas Mexico), Tikal (Mayan ruins in Guatemala), and more. People go cruising for all kinds of reasons, and one of our biggest goals was to learn first-hand about a foreign culture and its history. In this third year of floating along Mexico’s coast we began to feel that we’d accomplished that goal. When we first stayed at the Paradise Village Resort before Christmas last year, we knew nothing about the ancient ruins or cultures that are sprinkled throughout Mexico. Our cruising had been strictly focused on coastal destinations. 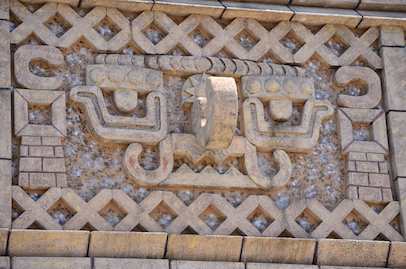 A huge lintel at one of the resort entrances reminds us of the stonework at the Mitla ruins in Oaxaca. Now we felt really grateful to have gotten off the boat and seen some of the wonders of the ancient world. As we looked around the resort now, we recognized the historic references to antiquity. Last spring, we had crawled all over — and loved — the ruins at Palenque, Monte Alban, Yaxchilan and Bonampak. The lintel over the huge stone arch at one of the resort entrances looked very much like the stonework we had seen at the Zapotec ruins of Mitla outside of Oaxaca City, and the statuary around the resort was reminiscent of the stone statues we had seen at Yaxchilan. Last year we had been alarmed by the roaring sound of the howler monkeys in the trees at Palenque, because we had thought the sound came from jaguars. 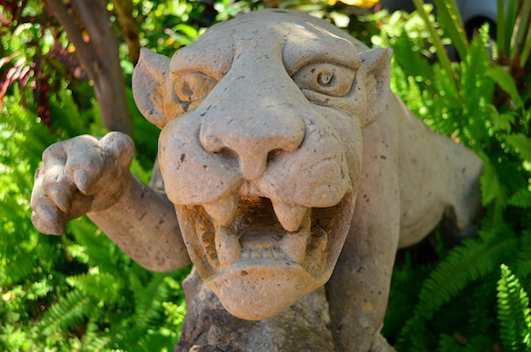 Here at Paradise Village, the jaguar statue looked very fierce — but not nearly as intimidating as Diego, the Tiger-in-Residence at the resort. The tigers were both very regal. 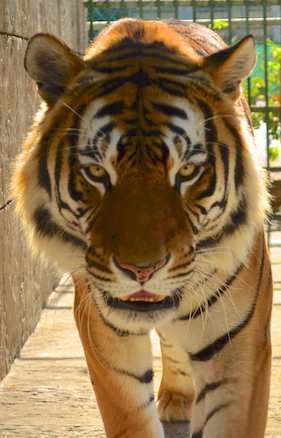 Diego and his companion Daisy are part of the Paradise Village Bengal tiger program that has produced over 76 cubs from 9 females and 3 males since 1996. 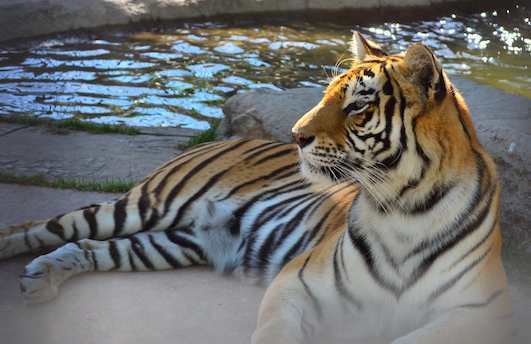 We learned it is the most successful tiger breeding program in Mexico, and the cubs have been relocated to zoos all over Mexico and Latin America. Exotic flora and fauna abound at the resort, and a collection of macaws and a cockatoo give the place a really jungly sound each morning and evening as they squawk and holler at each other and their caretakers. There is a fun parrot show twice a week, and these guys are really amusing to watch! 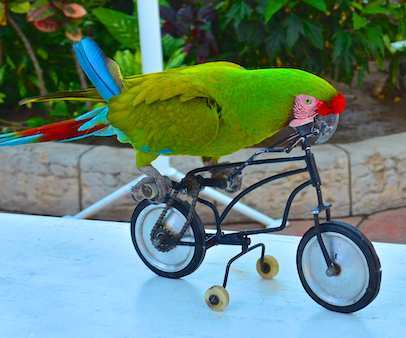 A native military macaw prepares for the Tour de France. 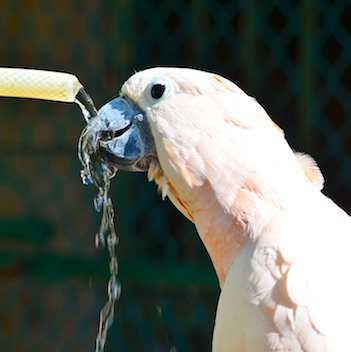 The Moluccan cockatoo gets a drink. 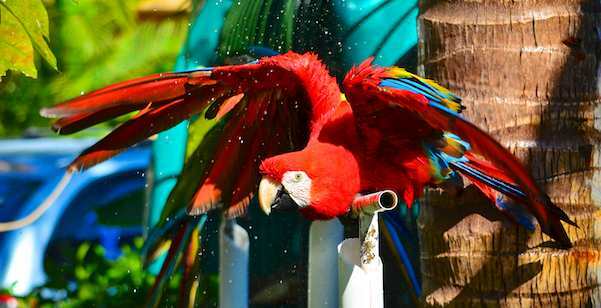 The scarlet macaw went crazy during his shower every morning. The olive green military macaws ride bikes, balance on balls, and do toddler-level exercises with jig-saw puzzle shapes and blocks. A blue and gold macaw roller skates, and the scarlet macaw and cockatoo pose with kids for photos afterwards. He loved his bath as much as I loved that hot tub in the spa! Their trainer has worked with them for many years, and it is one big happy family. Every morning she brings out a hose to clean their cages, and they all take advantage of the water spray to get a bath and take a drink. Ahhh… a Venti Hazlenut Latte at last!! The military macaws are the only native parrots in this flock, and their breeding program at the resort must be very successful, as there were ten or so of them, including a few loving (and squabbling) pairs. Down at the mall (there’s a mall!! 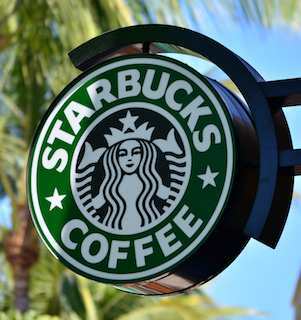 ), we found not only Subway, Domino’s and McDonalds (believe me, these are very appealing when you’ve been at anchor for a long time), but there was a Starbucks. Ooooh that first Venti Hazlenut Latte was yummy. 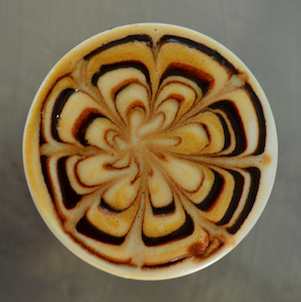 Better yet, another little coffee bistro nearby had fluffy coffees with pretty designs on top. At first, we had planned to stay at Paradise Village Marina for a month or so. Little did we know that our stay would stretch out to be longer than that! 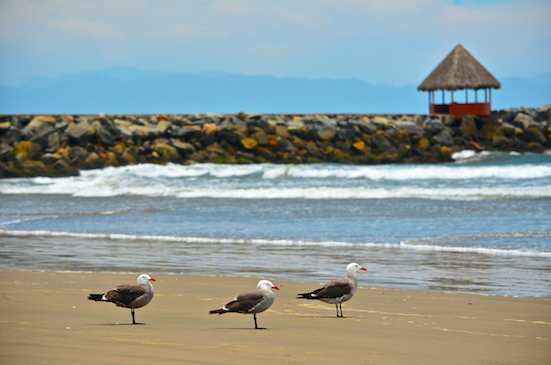 This entry was posted in Mexico's Mainland Pacific Coast (North) and tagged Mexico, Mexico's Mainland Pacific Coast (North), New, Resorts, Travel, WP Travel by Roads Less Traveled. Bookmark the permalink.